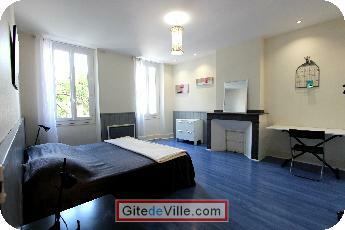 Self Catering Vacation Rental of 220 m² in Albi for 15 peoples. NEW ON ALBI. We offer a friendly and comfortable accommodation in the city center, 2 minutes walk from the station "Albi city", and only 5 minutes walk from the historic center. Free public parking is possible on site and notice that the gendarmerie is at the end of the street! - A sunny terrace to relax. For people who want it, you will find 50 meters, all the necessary facylties for your holidays (restaurants, bars, supermarkets, bakery ...). Each room (5 rooms in total, 15 people max, beds 90x190) offers Wi-Fi, a desk, fan and three shared bathrooms. The Fabul'House accomodation is less than 30 minutes drive from the most beautiful villages in the Tarn (Cordes, Ambialet, Lautrec ...). I could give you good advice on the best sites to visit Albi and the Tarn region. Hope to see you soon. - Cleaning is done by us in the bathrooms, living room, wc. However, you are asked to respect the premises during your stay such as cleanliness of the kitchen after your use. Last Ads update : 05/02/2018.